Where: All of the rides start in Vietnam’s Capital, Hanoi, and head south. When : the ride is best done during the summer or autumn months; central Vietnam can be cold and rainy in winter. How The best way to do the trail is with Explore Indochina (www.exploreindochina.com). During the Vietnam War (or, as the Vietnamese call it, the American War), US bombers dropped hundreds of thousands of tons of bombs on a series of trails and roads -- called the Ho Chi Minh Trail to the Americans -- that ran through Vietnam, Laos and Cambodia. From the mid-1960s until the early 1975, B-52s and other warplanes tried in vain to stem the flow of weapons and supplies from North Vietnam to combatants who were fighting in the South. Although the supplies were slowed, the overall stream of military hardware was never halted. The Ho Chi Minh Trail was a success. Even in peacetime, the trails never disappeared. Some were so established that they were paved over and became motorways. There is one particular section of road north of Hue that was once part of the Trail; other roads across Vietnam were similarly so. Much of the network became backcountry paths used by villagers and farmers; many civilians lost lives and limbs to the bombs that never exploded. The majority of the countryside has been cleared since the end of the war. Enter a group of motorcycle enthusiasts -- specifically a group out of Hanoi called the Hanoi Minsk Club, diehard fans of the sturdy, Russian-built Minsk motorbike. Through careful research and by talking with locals, they have managed to map the entire length of the trails, establishing a ride that covers much of the original route. Some of it involves backcountry riding; other sections are on sealed roads. But its' a journey that takes you through some spectacular scenery. 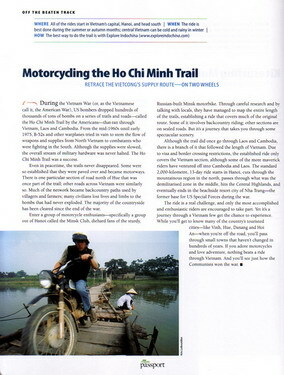 Although the trail did once go through Laos and Cambodia, there is a branch of it that followed the length of Vietnam. Due to visas and border crossing restrictions, the established ride only covers the Vietnam section, although some of the more maverick riders have ventured off into Cambodia and Laos. The standard 2,000-klilometre, 13-day ride starts in Hanoi, cuts through the mountainous region in the north, passes through what was the demilitarised zone in the middle, hits the Central Highlands, and eventually ends in the beachside resort city of Nha Trang -- the former base for US Special Forces during the war. The ride is a real challenge, and only the most accomplished and enthusiastic riders are encouraged to take part. Yet it’s a journey through Vietnam that few get the chance to experience. While you'll get to know many of the country's touristic cities -- like Vinh, Hue, Danang, and Hoi An -- when you’re off the road, you'll pass through small towns that haven't changed in hundreds of years. If you adore motorcycles and love adventure, nothing beats a ride through Vietnam. And you’ll see just how the Communists won the war.